The Parthenon of Books: The return of democracy to Argentina in December 1983 was the inspiration that led Marta Minujín to create a replica of the Greek Parthenon on the “9 de Julio Avenue,” a street located in Buenos Aires, Argentina. 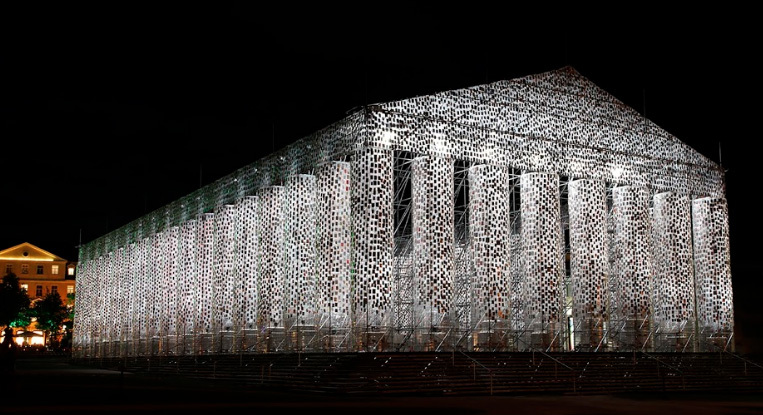 Mujín’s Parthenon has a metal structure covered with more than 20,000 books, many of which had been banned during the military dictatorship. The Parthenon of Books honors the world’s first democracy and the values of that era, which have served as the basis for today’s Western democratic societies. This work also stands as a symbol of the country’s prolonged need and renewed hope to transition back to democracy. Over time, Mujín’s throught-provoking work has become an icon of freedom of expression. In 2017, the artist was invited to present a new version of this project at the 14th Edition of Documenta, one of the world’s top contemporary art events that takes place every five years in Kassel, Germany. Her new work was praised and highly acclaimed by the critics, who saw in this powerful piece an emblem of democracy and global freedom. Rayuelarte is a playful and interactive intervention created by pop artist Marta Minujín in order to honor renowned Argentine writer Julio Cortázar, who wrote a book entitled “Rayuela.” Minujín reimagines Cortázar’s emblematic literary piece to bring to life an art piece that appeals directly to the participation of the public, for Rayuela is also a popular game played by children –and some adults– across the world. Marta Minujín (b.1943, Buenos Aires) is a multifaceted artist and a highly emblematic figure of Argentinian art since the 1960s. Hailed as one of the world’s greatest pop artists, her work has been shown across continents and in countries all over the globe.